In the last 20 years, robotic-assisted gait training (RAGT) was considered to be more feasible and effective in improving walking capacity. There are two types of RAGT that are available in rehabilitation research and these provide repetition of guided leg movements; these are end-effector and exoskeleton types of robotic training. The exoskeleton device is widely used in nonambulatory participants since it has a robot-driven exoskeleton that supports participants in initiating walking steps. The RAGT device provides assisted active movement for stroke participants; it eliminates the role of the physical therapist in manually supporting participants' steps. Another advantage is that impaired participants can begin early intensive gait training in their rehabilitation program. Hesse et al. were the first researchers who used the body weight supported treadmill training (BWSTT) approach in the stroke population. Their results showed that the BWSTT group did better than the control group. Visintin et al. also investigated its effectiveness on 100 stroke participants, who had walking difficulties and who were above 65 years of age. However, there are several recent controlled studies that suggested contradictory results. The purpose of this study is to investigate whether RAGT improves walking capacity (e.g., gait velocity) compared with conventional gait training (e.g., over-ground gait training) in stroke survivors. We used the electronic Medline database (e.g., PubMed, Ovid, ISI of knowledge) to identify trials. We limited the searching process for randomized clinical trials (RCTs) only and recent studies between 2000 and 2017 because the robotic approach had only just started within this period. To identify these clinical trials, we used the following terms for the search: robotic-driven gait AND 'stroke rehabilitation, Gait training AND stroke rehabilitation, Lokomat AND stroke rehabilitation, Lokomat AND over-ground physical therapy AND stroke rehabilitation, BWSTT AND stroke rehabilitation, gait speed AND stroke rehabilitation. We included only RCTs to get reliable outcomes and to prevent any confounding factors. We included only recent studies that used RAGT. We included participants who were ambulatory and nonambulatory at study onset. Participants of at least 18 years of age following stroke were included in our study. Research studies with participants who had a prior stroke and who had previously received any other physical therapy were excluded from our meta-analysis. We searched and included all RCTs that investigated the effectiveness of RAGT alone compared with conventional physical therapy, which is over-ground gait training. However, we exclude any clinical trials that used the end effector robot as an intervention, since it is not robot-driven gait that helps participants who have suffered a stroke to initiate steps. Furthermore, we excluded the trails that did not consider conventional physical therapy as a control group. The most important aspect in regaining a functional poststroke outcome is walking speed. Therefore, our primary outcome measure is gait speed (in meters per second). We included all trials that used a self-selected speed measure as their primary or secondary outcome measure. We investigated the effectiveness of robot-driven gait training compared with over-ground gait training in terms of gait speed. The details of the selected four studies and their strength and weakness are, respectively, shown in [Table 1] and [Table 2]. For selection and identification of relevant studies, two reviewers performed the process of selecting studies independently and disagreements between reviewers judged by a third reviewer. The reviewers extracted data from only published data. We intended to select only clinical trials to minimize the risk of bias in individual studies. We included four randomized controlled trials in the study, with 308 participants. After adjusting our searching strategy, all trails that did not use conventional physical therapy as a control group, and any trial that did not use RAGT were excluded from the study. Only four studies met our inclusion, and exclusion criteria were included in the meta-analysis. All four studies that were selected were randomized controlled trials published in the English language. The duration of the intervention was 6 months for the Hornby et al. study. Three months duration of the intervention was conducted in the Hidler et al. study. Finally, both Westlak and Patten and Husemann et al. studies were conducted over 4 weeks., The four trails involved 157 participants at the baseline, and 145 participants completed the studies [Table 1]. Only one trial had the intention to treat analysis to minimize the effect of the attrition rate. However, the three trials did not perform an intention to treat analysis in their study, and the Hornby study had the highest attrition rate among the four studies at 23% of enrolled participants, see [Table 1]. Regarding the intervention, all four trials used the RAGT as their intervention arm and over-ground gait training as their control arm. All trials used self-selected speed measure (in meters per second) as their primary or secondary outcome measure. All trials failed to show significant differences between groups except the Hidler study; that study showed that the control group did better than the treatment group. In other words, the control group had a 91% higher improvement in gait speed than standard treatment or the Lokomat group. Westlake and Patten study revealed that the treatment group showed a significant difference within the group but not between groups. Therefore, the average overall improvement rate in gait velocity was 61% (70%–50%) higher in the control than in the treatment group. In addition, the pooled effect size showed that there is a significant difference between groups in favor of control group P = 0.003, [Figure 1]. [Table 2] showed more details about the individual results (effect sizes and confidence interval) and the overall effects sizes of results. The homogeneity of variance test showed that these studies are homogeneous. By Q statistics, Q = 118.11 and the critical value was 9.488 at α = 0.05, k = 5. Hence, the homogeneity test failed to be rejected, and we assume that these size effects are estimates of a single population parameter. 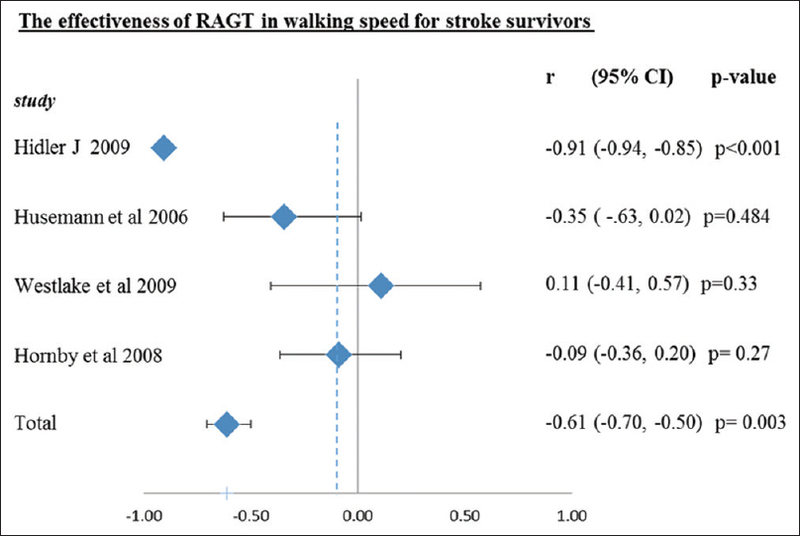 The aim of this meta-analysis is to investigate the effectiveness of RAGT alone on walking speed for stroke survivors. There were many randomized controlled trials on stroke victims which had seen the positive effect of RAGT when combined with conventional physical therapy. The studies which were selected in this meta-analysis were very peculiar in study design as they only had RAGT in the experimental group and conventional physical therapy in the control group. Many stroke survivors have walking difficulties, so regaining the ability to walk is the main goal of rehabilitation interventions. Overall, the main findings suggested that the conventional physical therapy – over-ground gait training – did significantly better than RAGT alone. There was no single study which showed a significant difference in favor of robotic versus over-ground training between groups. Hidler et al. suggested several reasons for this finding. Pelvis movement is restricted during conventional RAGT, so this restriction prevents pelvic rotation and weight shifting between legs. Furthermore, RAGT may reduce volitional muscle activity and subsequent learning. Another reason, which might have an impact on the results, is the fixed intensity of the robot's speed. Pohl et al. suggested that participants with fast treadmill training showed better outcomes than those with slow treadmill training. The main limitation of our meta-analysis is that only one reviewer performed the process of selecting studies and extracting the data. Furthermore, the data were extracted from only published data, and there was no direct contact with the authors to get unpublished data. Another limitation is that three of the four trials did not perform an intention to treat the analysis, especially the Hornby et al. trial that had 23% of enrolled participants, and this rate was considered to be high when we consider 20% is the normal limit of the attrition rate. RAGT alone is not effective in improving walking speed in stroke survivors compared with conventional physical therapy that is an over-ground walking intervention. Despite the fact that it is costly and takes a long period of time in adjusting the device, it is not effective for use in the rehabilitation setting. However, future studies might find beneficial outcomes when RAGT is combined with conventional physical therapy compared with conventional physical therapy alone. Jørgensen HS, Nakayama H, Raaschou HO, Olsen TS. Recovery of walking function in stroke patients: The Copenhagen stroke study. Arch Phys Med Rehabil 1995;76:27-32. Hesse S, Bertelt C, Jahnke MT, Schaffrin A, Baake P, Malezic M, et al. Treadmill training with partial body weight support compared with physiotherapy in nonambulatory hemiparetic patients. Stroke 1995;26:976-81. Barbeau H. Locomotor training in neurorehabilitation: Emerging rehabilitation concepts. Neurorehabil Neural Repair 2003;17:3-11. Husemann B, Müller F, Krewer C, Heller S, Koenig E. Effects of locomotion training with assistance of a robot-driven gait orthosis in hemiparetic patients after stroke: A randomized controlled pilot study. Stroke 2007;38:349-54. Kwakkel G, Wagenaar RC, Twisk JW, Lankhorst GJ, Koetsier JC. Intensity of leg and arm training after primary middle-cerebral-artery stroke: A randomised trial. Lancet 1999;354:191-6. Van Peppen RP, Kwakkel G, Wood-Dauphinee S, Hendriks HJ, Van der Wees PJ, Dekker J, et al. 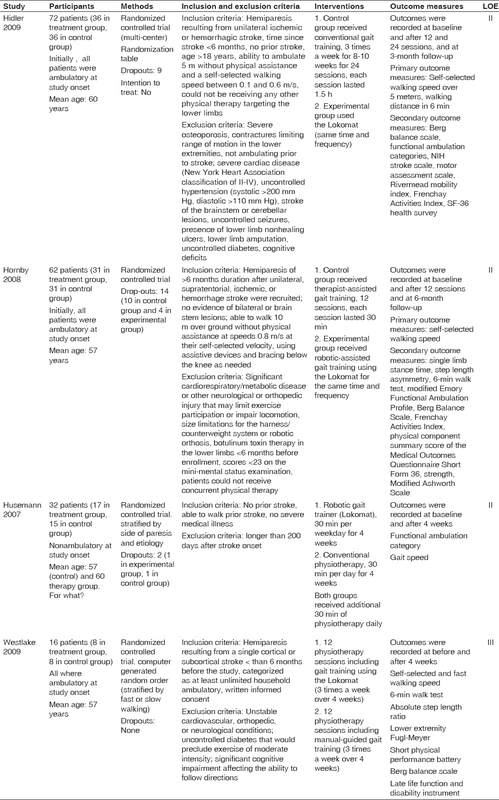 The impact of physical therapy on functional outcomes after stroke: What's the evidence? Clin Rehabil 2004;18:833-62. Hidler J, Nichols D, Pelliccio M, Brady K, Campbell DD, Kahn JH, et al. Multicenter randomized clinical trial evaluating the effectiveness of the Lokomat in subacute stroke. Neurorehabil Neural Repair 2009;23:5-13. Visintin M, Barbeau H, Korner-Bitensky N, Mayo NE. A new approach to retrain gait in stroke patients through body weight support and treadmill stimulation. Stroke 1998;29:1122-8. Kelley CP, Childress J, Boake C, Noser EA. Over-ground and robotic-assisted locomotor training in adults with chronic stroke: A blinded randomized clinical trial. Disabil Rehabil Assist Technol 2013;8:161-8. Hornby TG, Campbell DD, Kahn JH, Demott T, Moore JL, Roth HR. Enhanced gait-related improvements after therapist- versus robotic-assisted locomotor training in subjects with chronic stroke: A randomized controlled study. Stroke 2008;39:1786-92. Westlake KP, Patten C. Pilot study of lokomat versus manual-assisted treadmill training for locomotor recovery post-stroke. J Neuroeng Rehabil 2009;6:18. Pohl M, Mehrholz J, Ritschel C, Rückriem S. Speed-dependent treadmill training in ambulatory hemiparetic stroke patients: A randomized controlled trial. Stroke 2002;33:553-8.